Whilst on my gap year, I knew that I wanted to teach English abroad. When researching organisations that could help me achieve this at fairly short notice, I found Projects Abroad. Having never travelled to Asia before, Hanoi seemed like a suitable fit. I wanted to do my project in a city that would allow me to immerse myself in the culture, whilst simultaneously giving me the chance to travel, relax and have fun. I couldn’t have chosen a better place to spend two months. When I arrived in the bustling Hanoi airport, I couldn’t help but feel overwhelmed. Suddenly, I was all alone in a country I’d never been to before, where I couldn’t speak the language nor did I know my way around. However, this sense of panic didn’t last long. As soon as I passed through customs, I was met by a member of Projects Abroad staff. They reassured me that I would not have to figure everything out by myself. Indeed, from that moment onwards the staff in Hanoi did everything they could to make sure I had a stress-free, enjoyable time on my project. From the lovely cook (who makes amazing food) accommodating all my dietary requirements, to staff repeatedly walking me from the house to the office because I’m incapable at following directions, I was made to feel completely at ease in a very foreign setting. 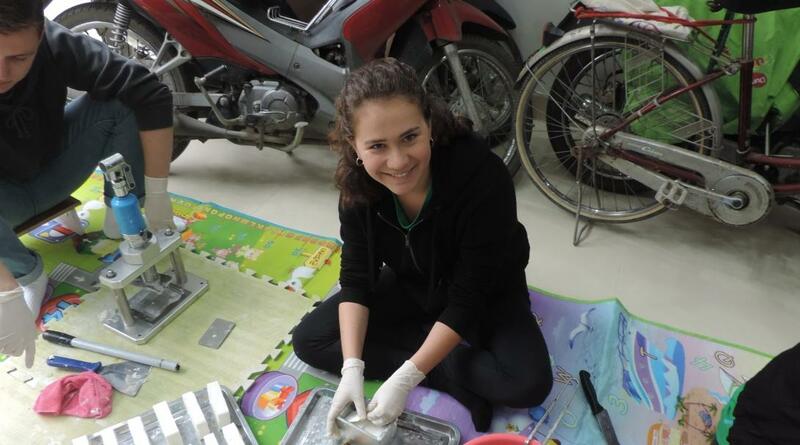 Living in the volunteer house meant I was able to make friends quickly; by the end of the community soap making event on day two, the worry of whether I’d get along with my housemates had vanished. After spending the weekend settling into my new house, I was met by my project coordinator who took me to the primary school I’d be working at. She made sure that I understood what to expect during my time there, and assured me that she’d be able to help with anything I needed in regards to my project. This promise was kept to the highest degree: there was not a day where I felt that I wasn’t supported. My project coordinator helped me every step of the way; whether I needed resources, struggled to communicate with the teachers due to the language barrier, or simply was not feeling well. Her kindness and care for her volunteers showed constantly, and it was really appreciated. My day began at 9am, and finished at 4:10, with a three-hour break in the middle. Although this may not seem like a lot of hours, the time in the classroom is extremely intense and thus can be exhausting (as well as enjoyable) and does not include time I spent planning lessons. I would do the planning during the break. The project was not always easy, and I faced my fair share of challenges. For the most part, learning how to control 50-60 Vietnamese 8-11 year olds is, at first, difficult. I learned how to do this through a variety of techniques, but I found a clapping game to be the most effective of them all. I taught the children a clapping sequence, and helped them to understand that when they heard me doing it, they were to join in and stop talking: a much more effective method than shouting. In addition, I found disciplining the children to be difficult. Eventually, I learnt that if you have a group of children not listening and instead talking, you have little choice but to ignore it and focus on the ones who are willing to listen. Although this can be frustrating, it is more important to focus on those children who want to learn, rather than spending lesson time telling off the ones that don’t. This is especially true given the size of the classes and the language barrier. However, the difficulties I faced taught me a great deal, and overall the experience was nothing but positive. I found that the challenges were minimal in comparison to the rewarding nature of my Teaching Project. Outside of teaching time, Projects Abroad organised a number of activities to ensure we were getting leisure time alongside our hard work. From going to see movies, walking around the Old Quarter, going to bars, escape rooms, and even mini-golfing, we always had the opportunity to participate in something fun every week. In addition, I was able to travel on the weekends. The Projects Abroad staff offered advice on where to go based on my interests. They also connected the volunteers to a lovely travel agent who organised our weekend trips if we wished. My favourite places to visit were Ha Long Bay, and Mai Chau. Overall, my time in Hanoi and on the Teaching Project was both extremely valuable and really enjoyable. I was very grateful to have the support of Projects Abroad; with their help, a scenario that could’ve been stressful and challenging became one of the most rewarding and memorable experiences of my seven months abroad, and I would definitely like to come back to do another project in the future.